Medical marijuana has been one of the most contentious topics in the news these past couple of years. State legislators can pass laws regarding “legalizing” this plant, but our federal government still considers it an illegal drug, and possession and/or use of it can still cause arrest, trials in court, and jail time for those persons caught in this illegal act by federal authorities. Splashed over many headlines today, May 28th, 2015, is the announcement that Florida Administrative Hearings Judge Watkins, rejected claims by an Orange County nursery that the state’s proposed rules and regulations were unfairly developed so as to give advantage to bigger, politically connected nurseries to win the only five regional medical-marijuana-growing licenses which the law allows. Due to this final ruling, the Florida Department of Health can file the rules and begin soliciting applications for the five licenses within three weeks. Of course, this may be delayed again, if the Baywood Nurseries of Apopka appeals this latest decision by Judge Watkins. 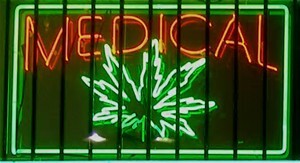 The medical marijuana law was approved by the Florida Legislature in 2014 and was to be effective last July 1st; however, it got bogged down in the usual bureaucracy and challenges for nearly a year. Time will tell if five licensed Florida nurseries will be enough to fill, as of now, the unknown demand. As time goes by, I’m sure many other questions and problems may arise. Unlike Colorado, which acted quickly, Florida’s governing bodies are historically usually slow-moving, but I hope that the suffering of children and adults will be alleviated by medical marijuana sooner rather than later. 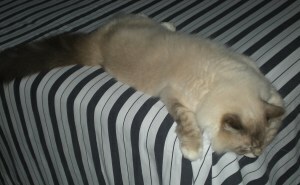 Romeo loves this position. He finds it very comfortable, and has been doing this since he came into our home. 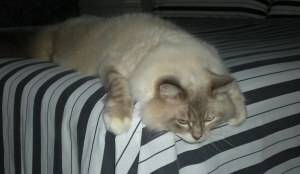 Romeo loves to assume a position that I have never seen another cat assume. 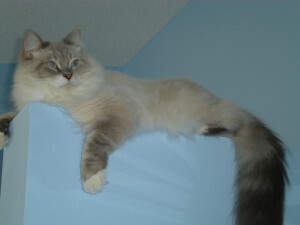 He loves to have his head overhang the edge of anything; counter, bed, chair – even the top of the shower wall. 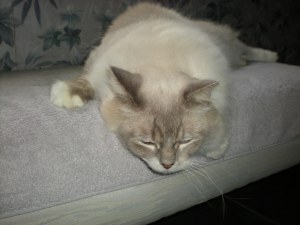 This position appears to be uncomfortable to me, but, we cannot imagine all that goes on in the minds of our cats. Sometimes, we believe we know, but we’re only fooling ourselves. 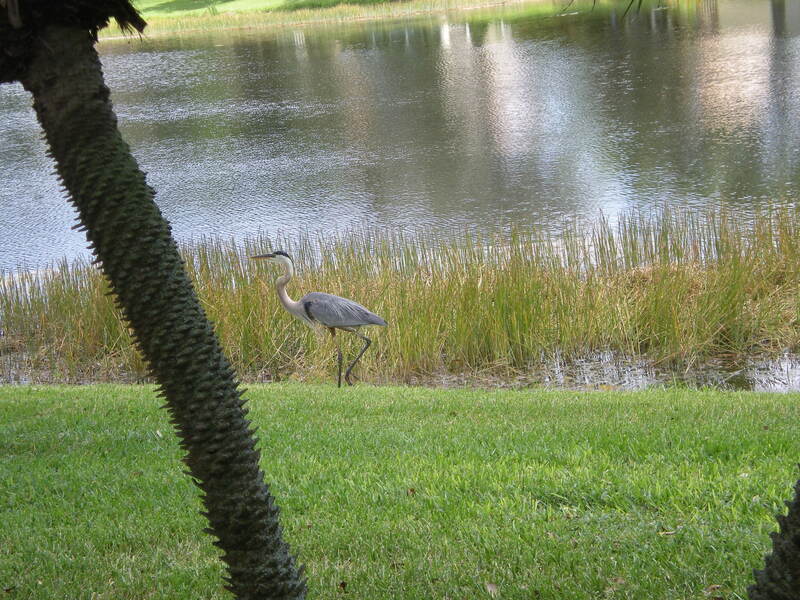 Many times, when I look out my bedroom window, I will see the wonderful birds that visit the lake. 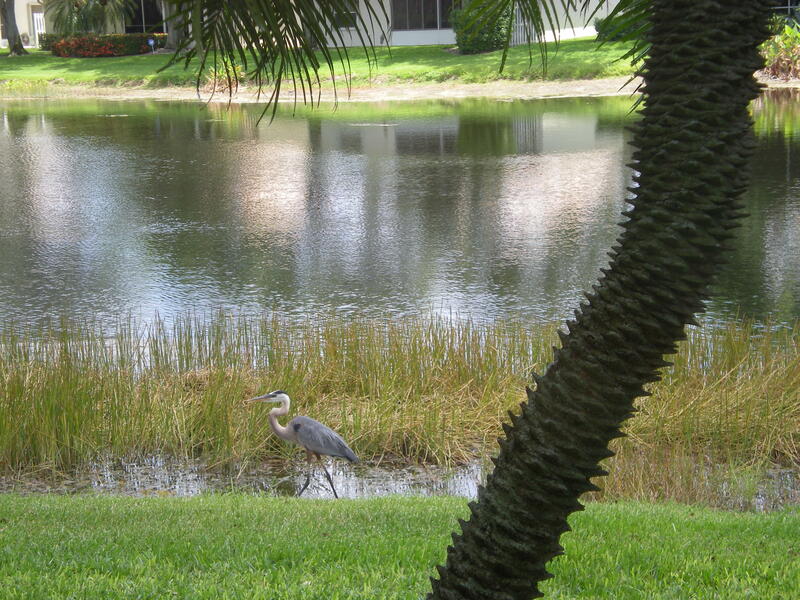 Yesterday, the Great Blue Heron made his rare appearance – much to my delight. 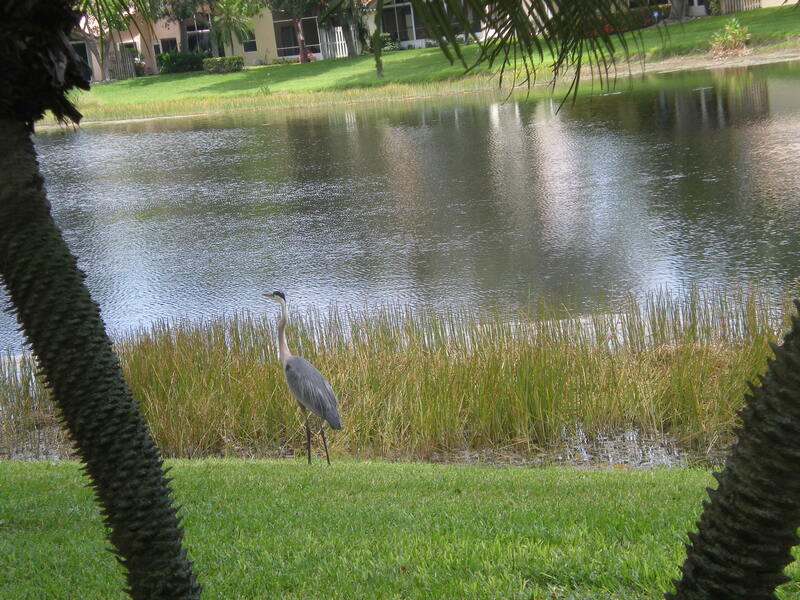 The Great Blue Heron stands about 4 feet high, the Tricolor stands about 2 feet. Another major difference is the coloring. In the past, I confused the two herons in my mind. I have it clear now. They are confusing because The Great Blue is not gray-blue mostly. It has a white head with a black feather sticking out the back and white neck. The Tricolor is mostly blue and has a zipper-like white stripe down the front of the neck. Whoever named these two had the intention of confusing us, I’m sure. I was lucky to be able to grab my camera and click a few, just before he flew away. I love when the heron makes the “S” with his long, very thin, neck. Just strolling along; always on the lookout for food. It looks like he’s eying something interesting. Just as sweet in sleep as she is while awake. 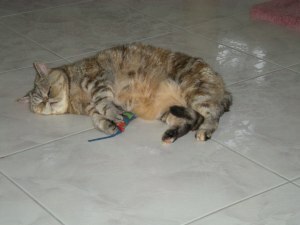 A rare occurrence: viewing Patches as she sleeps with a favorite toy. She was playing with it – tossing it and pushing it. 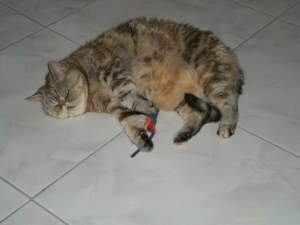 All of a sudden, she flopped down and went to sleep, still clutching the toy. Beautiful tribute, Cher. You have given us a real meaning of this holiday by your understanding and compassion. I would never wish anyone a “Happy Memorial Day.” It is a solemn holiday. 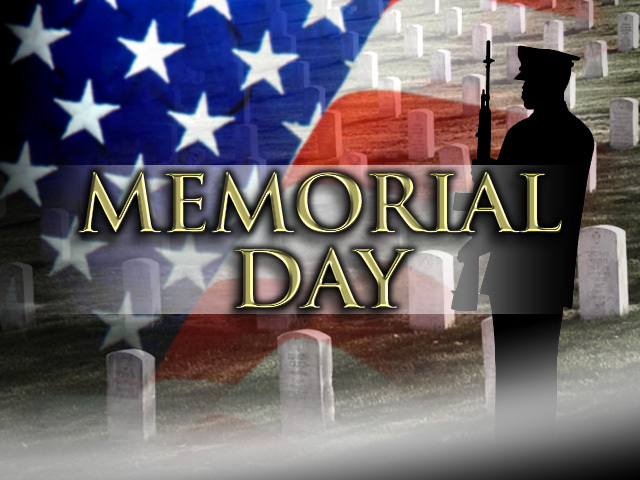 I was surprised this morning, when, one of the TV commentators, as he was signing off, wished everyone a “Happy Memorial Day.” He is a very intelligent person, and I’m assuming this was a great “slip of the tongue” on his part. This is a repost from Memorial Day, May, 2014. I hope you like it. 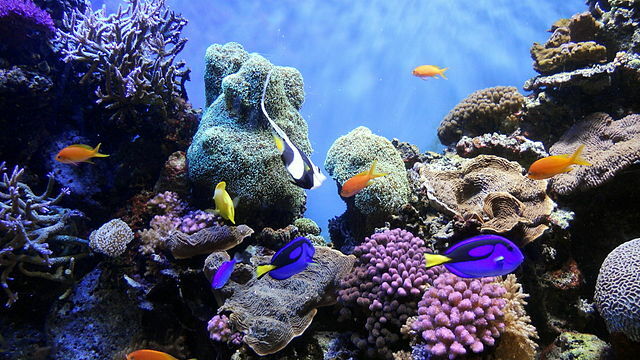 It could be that a great many people are not aware of the fact that our world’s coral reefs are dying. They must be protected. Thank you for this post. Yesterday on WUCF, our local PBS Channel, there was an excellent dual story about Coral Reefs and the depressing decline of them worldwide and also one about the alarming situation with Oysters. Coral Reefs are one of the most threatened and most in perilof all the world’s ecosystems and the future does not look good, unless, we step in and do what is necessary to stop what may soon become complete decimation. Renowned Australian Scientist, Marine Ecologist, Dr. Katharina Fabricius and her team have worked tirelessly for many years studying the negative impacts of various factors on Coral Reefs and Marine Life around the Globe and the program yesterday was dedicated to their work. Were You Thinking Of Having Rice For Dinner? 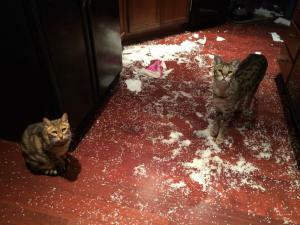 Just think of the cleanup after these cats had so much fun!! This photo caught my fancy. I laughed when I saw this mess. The cats look so innocent. A perfect welcome to this beautiful Sunday. Twelve-piece vocal harmony group from across the UK, aged between 21 to 31-years-old, perform their own rendition of ‘You Raise Me Up’. This is a huge Awareness week for ME (also Fibromyalgia and Multiple Chemical Sensitivities). Much preparation has gone into promoting awareness of this (ME) debilitating disease that takes patients’ lives away as they knew it before illness. I’m reblogging in order to continue promoting this disease so that more people might understand it. Well written. Excellent advice and inspiration for living. Years ago, I received a wonderful book For This One Hour, from my father. It’s a first edition, published in 1969, and has separate sections for being Grateful, Cheerful, Optimistic, Unselfish, Forgiving, and Generous; for spending Time in Prayer, looking for the Best in Others, helping to Make Someone Happy, and living in the Present. It’s a wonderful source of inspiration to me, and has been for many years. Today, with so much negativity in the world, I thought I would share one of my favorite passages, the Creed for Optimists: 10 simple things we can all strive to do for ourselves and our world to make both better. Promise yourself to talk health, happiness and prosperity to every person you meet.